Do YOU want to program yourself to super-boost your positive mind-set and have total confidence so that you feel great? This recording has two types of hypnotic relaxation experiences. The first type of relaxation is presented by Shayna who is now a Brahmachari and Master of Meditation. Shayna has a particularly beautiful way of using her voice to enable you to drift pleasantly on a journey around your body -allowing a beautiful and peaceful sense of relaxation to slowly creep around you and through you, so that your unconscious mind need concentrate on nothing other than allowing yourself to reach maximum relaxation. The second recording is by Dr. Janet Hall, who presents a hypnotic induction which will help you boost your confidence and help you get in touch with that deep, wonderful, powerful presence inside. You can listen to either version at any time. In fact, it could be wonderful to choose, depending on your state of mind, and each time you’ll note how the relaxation brings you a sense of calm, and comfort. And each time that you listen to the Total Confidence with Relaxation recording, it will be easier and easier to relax. And you are feeling stronger and stronger, and more and more alive. And confident, and proud, and happy. And finding that people are noticing that you have a warm glow around your face, around your eyes, and around your heart space. 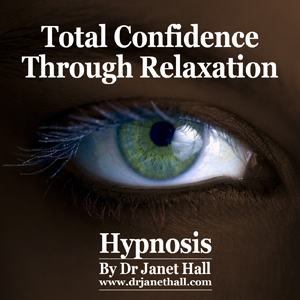 Regular listening to this Total Confidence With Relaxation recording will energise you and lead you forward into a loving, powerful life. Be Persistent – keep listening and you will feel better! So, if you’re serious about wanting to feel deeply Confident then you need to get a copy of “Total Confidence With Relaxation” right now!